Watching the Old Grey Whistle Test in 1978....lots of rock heroes playing a million notes to the minute and even a bit of punk...then this scruffy long-hair with terrible sideburns launches into a long meandering song called Like a Hurricane...kind of laid back, just totally into his playing without trying to impress anyone...my father, somewhat surprisingly, announced from his armchair, "whatever he's on I want some". I went out and bought the album (first released in 1977). This contained containing an even better version, apparently recorded during a first run through of the song when he was teaching it to the band (according to his recent autobiography). This was the song I most associate with my late teens...punk was great, I even discovered jazz, Thelonious Monk and John Coltrane but this was my touchstone. I've never got bored with it and it's cropped up at all kinds of unexpected times in my life since then.. I met up with an old friend from those days, years later and what comes on the radio? ..... As a regularly gigging guitar player and singer it's a reminder that an instrumental solo should capture the essence of the song....and definitely not be an excuse for showing that you can play more notes than the next guy; that way leads to poodle-haired rock madness. There's a certain feeling when a band is just playing at their best...the music just flows. I've been playing with the same bunch of musicians for twenty odd years...we get to that certain place sometimes.and that's why I keep playing. 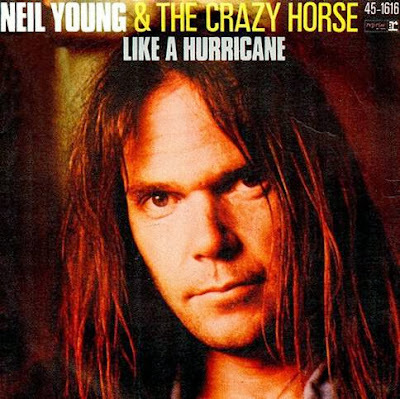 Old Neil is still selling out every tour and the last time I saw him in concert with Crazy Horse he was still truly magnificent and played some very long and at times startlingly avant garde guitar racket and kept the audience with him every step of the way. David sings and plays guitar for The Cane Toads. He also can be found 'wandering around in fields, making beeping noises'.